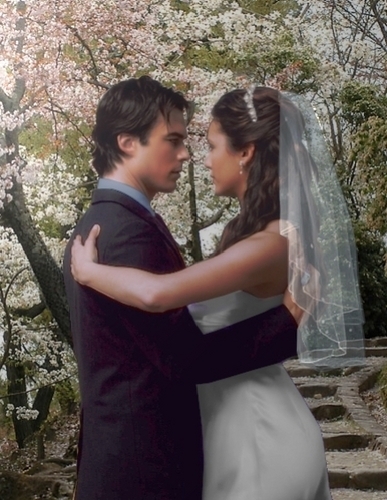 Elena and Damon's wedding. . Wallpaper and background images in the Vampire Diaries – Fernsehserie club tagged: the vampire diaries elena and damon. This Vampire Diaries – Fernsehserie fan art contains brautjungfer and trauzeugin. There might also be strauß, korsage, sträußchen, sträusslein, blumenstrauß, posy, nasegay, and corsage.